New Orleans is a shabby city. It’s gritty. It’s dysfunctional. It’s also welcoming, permissive, and profound. And nowhere is that collision—between the grit and the grand—more apparent than in the “neighborhoods.” Step away from the French Quarter and the tourists and the spirit of the city truly shines. It’s in the neighborhoods, too, where the subtleties and soul of the city live. Where the communities have taken on bits of the blight and turned them into places of inspiration and potential. Where art, music, and poetry are everywhere—placemaking is everywhere—if you take the time to look and listen. With community-based participation at its core, placemaking is a novel approach to the planning, design, and management of public spaces—parks, empty lots, abandoned buildings and utility boxes. Placemaking allows local governments and the people to share responsibility of spaces—often thought of as “third spaces”—where informal social interactions happen with little stress, little money, and little effort. The placemaking concept was born from Jane Jacobs and William H. Whyte, urban writers and activists who wanted to “design cities for people, not just cars and shopping centers.” Jacobs encouraged residents to create tighter connections to their neighborhoods with “eyes on the street,” while Whyte believed public spaces were ideal for a vibrant social life. Placemaking is not new to many major cities, and it’s not new to New Orleans. But like the city itself, the placemaking initiative in New Orleans, in her neighborhoods, is like nowhere else. But like the city itself, the placemaking initiative in New Orleans, in her neighborhoods, is like nowhere else. If you cut through the French Quarter, pass over the jazz clubs on Frenchman, meander around Faubourg Marigny, and cross the railroad tracks on Press Street, you’ll find yourself in the Bywater. “Be nice or leave,” is the Bywater mantra. Oft credited to folk artist and resident Dr. Bob, “Be nice or leave” is found on street signs, in neighborhood cafes, and spray painted on fences. The Bywater is one of New Orleans’ oldest neighborhoods—carved out of colonial plantation land and nestled up against the Mississippi River. Traditionally a blue-collar community, it’s still home to the working class, although the “working man” (and woman) now reside alongside just about anyone—musicians, writers, lawyers, and doctors. And graffiti artists. Like the neighborhood slogan, graffiti is found everywhere. Public art or graffiti, who decides? Many people see graffiti as an expression of culture in urban areas. Others see it as a crime, as vandalism. 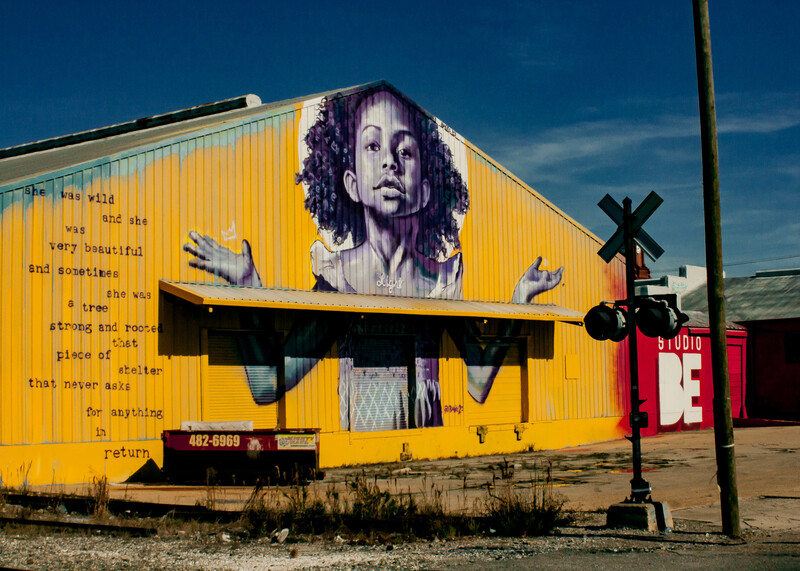 In New Orleans, purposeful graffiti has found a place in some neighborhoods, like the Bywater. It’s a means to express frustration over the social ills of bigotry and poverty. It’s an alternative to traditional media. It’s an opportunity to let artists showcase their work and brighten up a neighborhood. And here, graffiti can be legal; with a permit, of course. 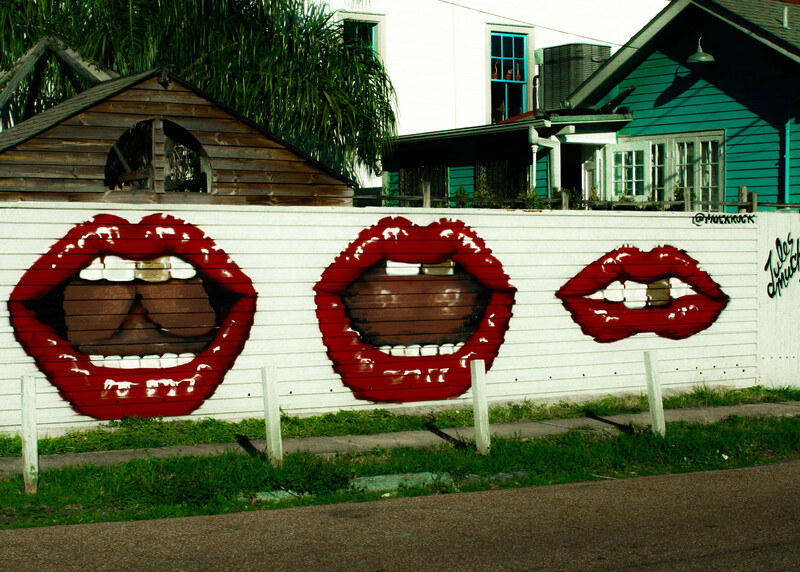 "Read My Lips” by Jules Muck along St. Claude in the Bywater, New Orleans. Known as a “Mural Permit,” the City Planning Commission (CPC) requires artists to apply, pay, and receive approval by the CPC before painting can begin. It’s a piece of red-tape, but it’s meant to support “good art” and provide permission to cover the bad. To encourage more legitimate artwork, the permitted kind, neighborhood associations like the Bywater-adjacent Faubourg Marigny Improvement Association (FMIA) actively involve the residents of the community. They ask neighbors to document graffiti tagging and submit photographs of unpermitted pieces. The FMIA also assists local artists with getting through the CPC approval paperwork. 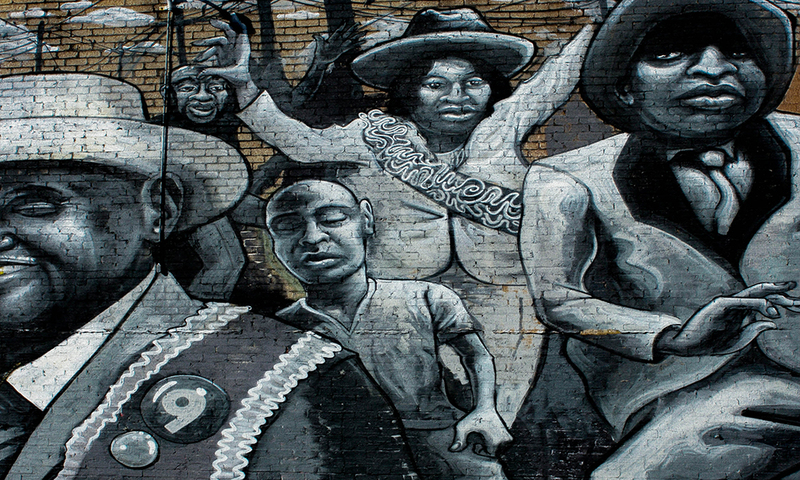 “Murals help fight blight and require permits. Let’s work on it,” proclaims a request in the June 2016 newsletter. "The Third Line (Nine Times)” by Henry Lipkis along St. Claude in the Bywater, New Orleans. The FMIA also solicits corporate sponsors—usually local restaurants, realtors, and other small businesses for Community Visions Unlimited (CVU), a nonprofit which runs a revitalization program known as the “The New Orleans Street Gallery.” The project awards an honorarium and a paint kit to local artists, who then create murals on ugly gray utility boxes, which were previously canvases for uninspired tagging. While sanctioned murals can be seen across the city, from Candy Chang’s “She dreamed of a place called Fat City” to Jeremy Novy’s swimming koi on Frenchman, arguably, the best street art, the purposeful graffiti, is on display in the Bywater. 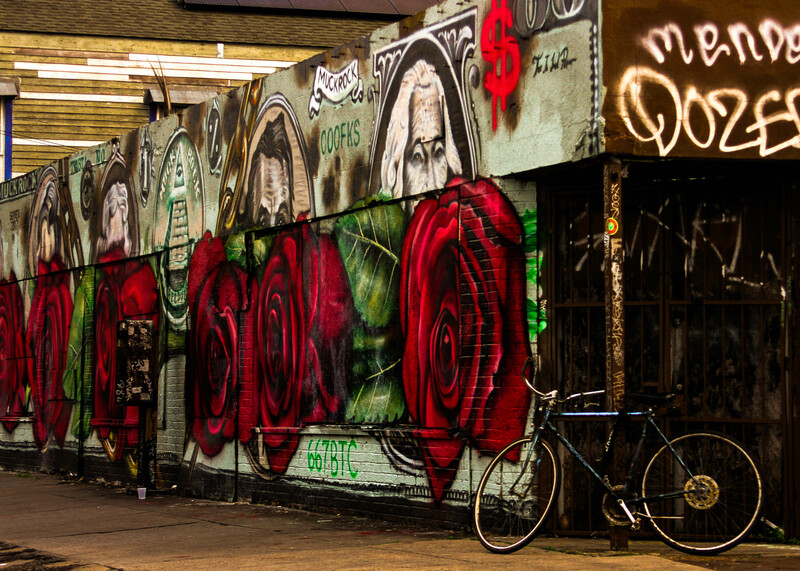 "Roses Over Presidents” work and rework by Jules Muck along St. Claude in the Bywater, New Orleans. Perhaps the most famous street artist in the Bywater is Brandan “Bmike” Odums. Known for his controversial storytelling murals—Project BE, the depiction of African-American civil rights heroes painted inside a deserted and Hurricane Katrina damaged apartment building, or Exhibit BE’s five-story, block-long collaborative mural on the Westbank. The latter was sanctioned, the former was not, although both were widely celebrated. Exhibit BE is thought to be the largest street art gathering in the South. "Some artists see blight or something else and see that there's a conversation that needs to be had about what's going on with the space," Odums says. "I noticed after Katrina so much blight and physical signs of indifference in communities, and I had the responsibility as an artist to use my art to transform the space." The final installment of Odum’s series is a solo show, a visual climax housed within a 35,000 square foot railroad warehouse known as Studio BE in the Bywater. “Ephemeral Eternal” grabs your attention from the moment you get near the space—the warehouse is painted a bright yellow and bears a 50 x 100 foot mural of a 3-year-old African-American child with outstretched palms. Inside the gallery are mural-scale portraits of Dr. Martin Luther King Jr., Muhammad Ali, Malcolm X, and other historic African American leaders. The civil rights themed show also pays homage to human rights advocates—John Lennon, Mahatma Gandhi, and the Dalai Lama. Other paintings depict victims of police violence and recent protests. “Ephemeral Eternal” is a beautiful and broken history lesson. "Ephemeral means temporary, not long lasting," Odums said in a January interview with NOLA.com. "Eternal is the exact opposite of that." As you walk towards the levee, to the end of North Rampart Street, at the back of the Bywater, you’re likely to hear some tinkling in the wind. Are those piano keys? Bells ringing? You’ve made it to The Music Box Village. 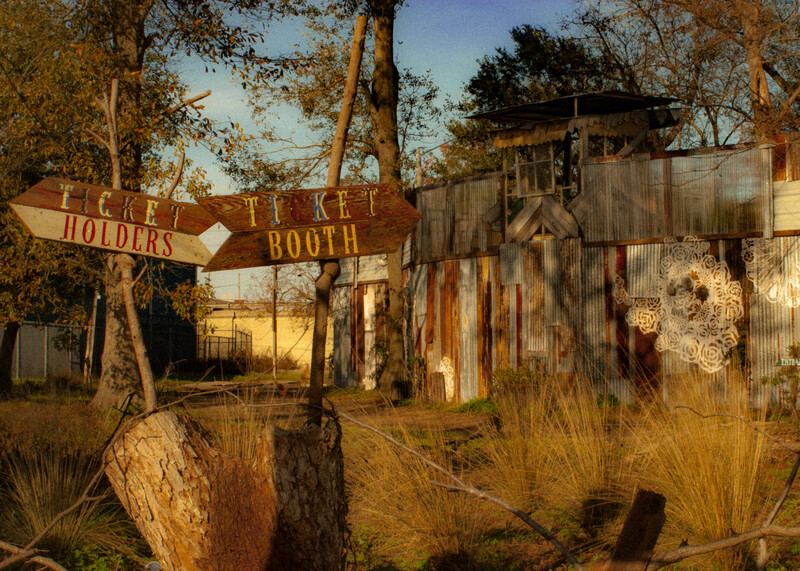 Housed in a 55,000 square foot open-air courtyard and adjoining metal fabrication warehouse, are a series of art installations, of interactive “musical houses” where on any given weekend, you’ll find children and adults roaming the grounds, jumping on musical floor boards high in a treehouse or pounding out off-key tunes on rusty metal piano keys. The Music Box Village in the Bywater, New Orleans. The Music Box Village was the brainchild of the nonprofit arts organization New Orleans Airlift. The founders intended, and succeeded, with building a “third place” where, “play, imagination, experimentation, collaboration, community and tons of hard work come together.” By day you interact with art, by night you can hear live music or attend a festival—a vibrant social scene all within walking distance of home. In a city like New Orleans, green space is a luxury. In neighborhoods far from the palatial lawns of the Garden District or without easy access to sprawling City Park, comes a reliance on urban farming and community gardens. In 2015, New Orleans was said to have 13 such gardens, and two, are located in the Bywater. The Clouet Gardens came to be when Bywater neighbors, tired of an overgrown and abandoned lot on their street, convinced the Housing Authority of New Orleans (HANO) to lease them the property. This “secret” neighborhood hang-out is volunteer and donation run, and is considered a Lonely Planet New Orleans attraction. “This formerly empty lot has been transformed by its Bywater neighbors into a wonderful little park filled with public art projects, murals, and generally appealing weirdness. Performances, concerts, and neighborhood get-togethers are frequently held here, and it's a favorite with local families.” It’s not so secret anymore. On the other side of the community garden continuum is the Press Street Gardens. 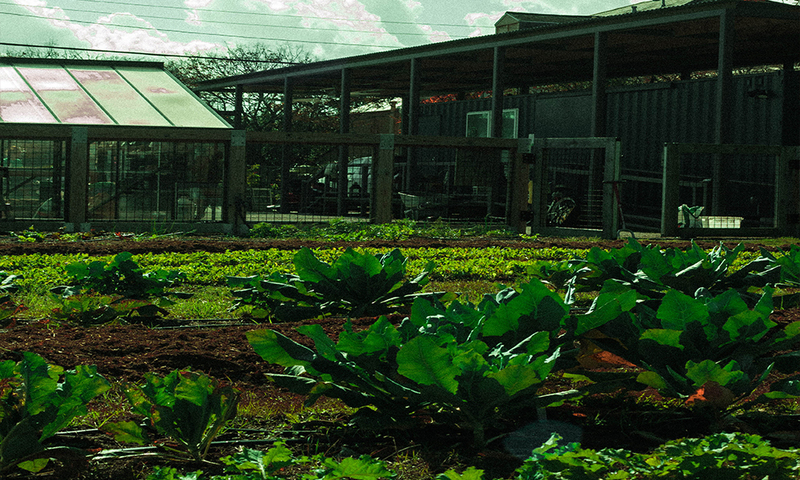 Funded by the New Orleans Center for Creative Arts (NOCCA) Institute, the Press Street Gardens is “an urban farming and outdoor learning laboratory” where goats and chickens live next to dogs and children playing in the adjoining park. Press Street Gardens in the Bywater, New Orleans. The fresh herbs, vegetables, and fruits are used by students in NOCCA’s Culinary Arts program, as well as by the Press Street Station restaurant. Local residents can volunteer at the gardens for access to fresh produce, or sign up for the community-supported Plant Share program. Cleo Wade is a poet, artist, stylist, and speaker. But she’s more than that—much more—to her legion of followers and readers, mostly young women disheartened with the political makeup and racially charged energy of the current United States. Her words—part self-love, part social action, part unified affirmation—have New York magazine’s The Cut calling her the Millennial Oprah. But for all her accolades, she started out as simply, a daughter of New Orleans. “I always say I was raised by three parents: my mom, my dad, and the city of New Orleans. They all are such huge characters,” she said in an interview with Anna Deutsch. Studio BE in the Bywater, New Orleans. Mural by Bmike Odums and words by Cleo Wade. And protect her, we do. Because New Orleans, specifically Bywater, is home.